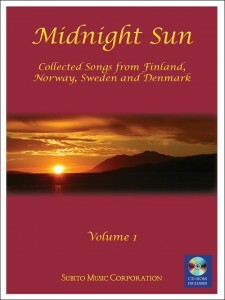 Welcome to Midnight Sun — the new three-volume collection of Scandinavian songs available from Subito Music Corporation. Compiled and edited by soprano Professor Mimmi Fulmer (University of Wisconsin-Madison), Midnight Sun Vol. 1 features music from Finland, Norway, Sweden and Denmark. The collection includes classical, folk and sacred songs with translations, phonetics, and recordings of the spoken texts. In addition to the volume’s printed songs, translations, and phonetic guide, the score also includes a CD-ROM which offers pronunciation directions for each language and sound recordings of a native speaker reciting each text. Midnight Sun, Vol. 1 features 19 songs, including classic songs by Edvard Grieg and Jean Sibelius. To add Midnight Sun, Vol. 1 to your collection, purchase it here in The Subito Store.